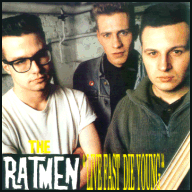 The Ratmen came from Belgium and were a Neo-Rockabilly outfit in the style of early Batmobile. Their singer/guitarist (Walter Broes) later turned up in The Seatsniffers. Their cover version of Joan Jett's 'I love Rock'n'roll' became very popular in Japan. Let's not talk about the insipid version by Britney Spears!